RVL 7 Ray Vander Laan 4/25/2010 Central Wesleyan Church The Lord is my banner. 1. Water. To the Egyptians, the passage into heaven went through the “Sea of Reeds”. For the pursuing Egyptians, the Red Sea, or as it is sometimes translated, the Sea of Reeds, became their passage into a Godless eternity. God divided the waters by a strong east wind all night long. 2. Spirit. The Hebrew word for spirit is Ruach (Roo-Auck). It is also the word for breath and wind. The wind blew all night and the Spirit of redemption and judgement set the trap for the Egyptians. Ruach HaKodesh is the Holy Spirit. 3. Fire. The Pillar of fire kept the Egyptians at bay until the trap was set. Like a baby out of the birth canal, the children of Israel came out the other side of the water as if they had gone through a new birth. God did all the work. The Israelites contributed nothing but their faith and obedience. It is a picture of our salvation. 1400 years later as Nakdimon Ben Gurion (Nicodemus) is talking with Jesus, the issue of the new birth comes up. Ray mentioned that many of us assume two things about this story, but with no support from the text. The fact that Nicodemus came by night does not in itself mean anything - perhaps it was because he couldn’t get away from the “office”. 2. We think that Nicodemus is being sarcastic or stupid when he says, “how can a man be born when he is old? Can he enter a second time into his mother’s womb? (mine:) Since the word "man" can refer to anyone, he may have meant how can a gentile be saved if he is not Jewish? Whatever the motivation, Jesus was telling Nicodemus that he had to experience the new birth as shown in Exodus. After the new birth, Israel is led to Mount Sinai. The order is: 1. Blood was shed for sins;with forgiveness appropriated by faith 2. The believer passes through the waters of baptism to dramatize the new birth 3. Then there is a presentation of God’s commandments, so that the redeemed people will know how to live in wisdom. Saved by Grace is a Biblical idea found throughout the Bible. The Jews as a whole did not believe that they were saved by keeping the commandments; this is a common misunderstanding that many Christians have. Exodus 15: 11-12 "Who [is] like You, O LORD, among the gods? Who [is] like You, glorious in holiness, Fearful in praises, doing wonders? You stretched out Your right hand; The earth swallowed them." It was the Lord’s right hand which accomplished their deliverance. How many times do we take credit for something that the Lord did for us? "The LORD [is] my strength and song, and he is become my salvation: he [is] my God, and I will prepare him an habitation; my father's God, and I will exalt him." In Hebrew it says “Yah is my strength and my zimrat. 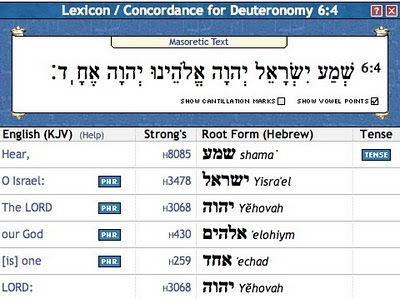 Yah is a shortened version of YHWH or the most holy name of God. Zimrat means song, defense, and strength. It represents God’s deep, total commitment to his people. “my salvation” literally is Yah-Shua, which is Jesus’ name in Hebrew. “He is my God and I will glorify him” has the word ve’anveh’hu which means that “I will become a dwelling place for him”. God is looking for a dwelling place within a community of people. In Acts 2, God shows up because the veil in the Temple (which cordoned off the Most Hold Place) had been torn in two. This was done in part to express the Father's grief over the death of His Son. But it also provided access for us to enter in, as well as providing the release for God to come out (as odd as that sounds). In the last post I ended with God leading them into the wilderness where the people complained because they had no water. Are we any better? [this is a comment from me-Dennis:] I wonder what God would have done if a person in the assembly would have come to Moses and said, “Please ask God how we should act or what we should do when we have legitimate needs, such as the need for water. How can we express those needs and not sin before you? [end of my comment]. Ray then mentioned a story from Aesop’s Fables. Aesop was a real person who lived during the time of King Croesus, in Sardis, in what is now modern day Turkey. Aesop was a member of King Croesus’ court and was one of the wise men that Croesus sought for advice. He wrote a whole collection of stories and they were all stories that had a hidden meaning or moral to the story. Revelation 15:2-4: “And I saw [something] like a sea of glass mingled with fire, and those who have the victory over the beast, over his image and over his mark [and] over the number of his name, standing on the sea of glass, having harps of God. They sing the song of Moses, the servant of God, and the song of the Lamb, saying: "Great and marvelous [are] Your works, Lord God Almighty! Just and true [are] Your ways, O King of the saints! Who shall not fear You, O Lord, and glorify Your name? For [You] alone [are] holy. For all nations shall come and worship before You, For Your judgments have been manifested." We will hear the song of Moses again in Heaven. This is the first time that the Lord is called King. Where there is a King there has to be a Kingdom. Though it will find its fulfillment when Jesus takes the throne in Jerusalem (my comment), his reign right now is not territorial, it is within his people when they enthrone Jesus in their lives. 40 days later as the people are encamped at the foot of this mountain called Sinai, God is putting on a pyrotechnic light show that instills fear in everyone. Ray, as a staunch Calvinist (speaking in a Wesleyan church), said that the Calvinists have stressed the sovereignty of God who rules the universe. But people can only be subjects by their choice, God wants to reign in their life - for at Mount Sinai he is calling the people to become a kingdom of priests. The Kingdom of Heaven has not made a more dramatic impact on our communities because so many have not made him Lord. Exodus 15:25-26 "There He made a statute and an ordinance for them, and there He tested them, and said "If you diligently heed the voice of the LORD your God and do what is right in His sight, give ear to His commandments and keep all His statutes, I will put none of the diseases on you which I have brought on the Egyptians. For I [am] the LORD who heals you." Jesus was tested by Satan three times, in the same order that the Israelites were tempted in the wilderness. In each case, Jesus quoted from Deuteronomy to counter Satan. 40 years - 40 days. These temptations also echo the main points in the Shema - and I have a feeling we’ll learn more about that next time.